It was a bit of a tough one yesterday if you didn’t know it, but it was Paris quadrifolia, a fairly localised and very distinctive wild plant in the south and east of England and much of Europe into Russia but not in Ireland nor often found in Wales or Scotland. Very much in layman’s terms, this plant is a bit like a trillium. But whereas trilliums, which have three leaves, petals etc, are mainly North American (with some Japanese exceptions), paris are from Europe and Asia and have anything but three leaves and petals. Trilliums are in Trilliaceae but paris, and a few allied genera, are in Melanthiaceae which also includes veratrum, and which were all in Liliaceae in simpler times. The Asian paris species all have whorls of many leaves and often fairly showy flowers with many petals and are definitely garden worthy if you have moist, humusy soil. They are also of note for having the largest genome (the amount of DNA) of any organism. The genome contains all the information needed for the organism to be created. The human genome weighs in at 3 picograms – and a picogram is one trillionth of a gram. 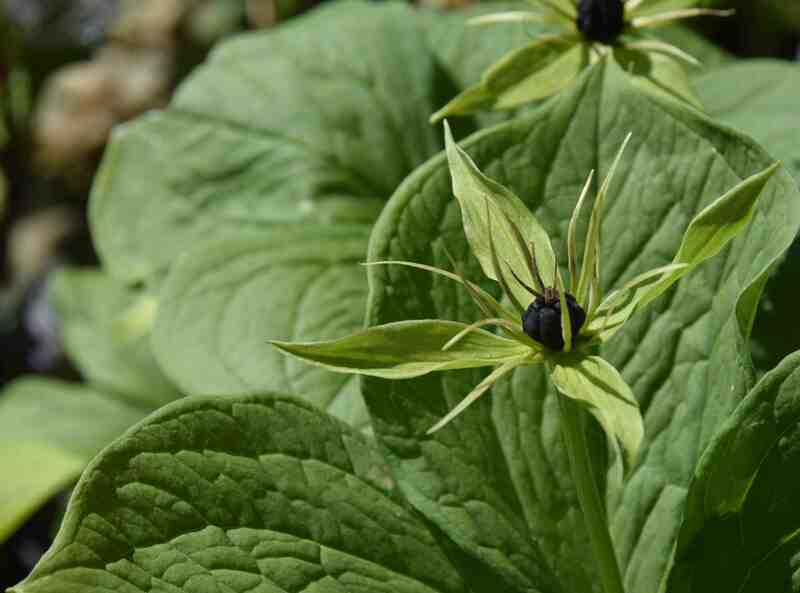 But Paris japonica has a genome that weighs 152 picograms – the largest by far of any known organism and, if stretched out, would be taller than the tower of Big Ben. And that is in every cell! Wow. Anyway, if you are still with me, Paris quadrifolia is a subtle wild flower and has four leaves at the top of the stem. The flowers have four broad sepals and four thin petals and eight stamens. The ovary in the centre is black with four stigmas. The name paris has nothing to do with the city or the man of Greek legend but from ‘par’ meaning pair, because the four leaves are arranged in two pairs, at right angles. In the wild it tends to grow in ancient woodlands and on alkaline soils. 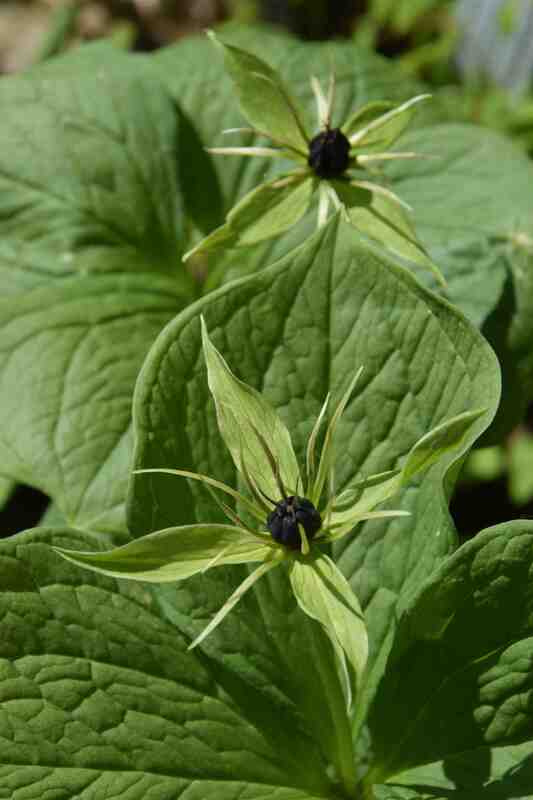 If it is anything like trilliums then it is very slow to establish from seed and it creeps slowly by rhizomes. 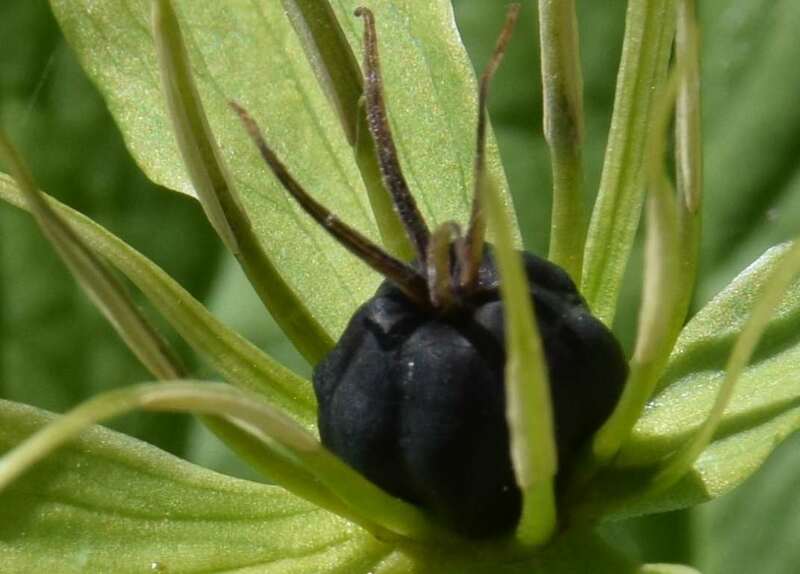 It is almost always called herb paris but the other English name is devil-in-a-bush which presumably refers to the black ovary, black being associated with the devil. I am not sure what pollinates the flowers – they certainly are not very attractive to bees and the plant tend to grow in damp and very shady places where bees are not likely to venture so I assume it is pollinated by beetles. While not the most showy of plants I am very pleased to have seen it again and to have the chance to grow it in my own garden.